University graduates are as vital a resource for the United States as anything that is mined, extracted, or farmed from nature. Without a well educated population, high-skilled jobs and extremely profitable research simply cannot occur in a country, thus the maintenance of a highly skilled work-pool is in the vital self-interest of every country. High-skilled workers not only draw investments in research and development, but are paid enough for their work that they become a significant portion of the economy’s buying power. In short, there is a very strong public interest for incentivizing intelligent students to aspire to a college education. While educated students are a very valuable resource, a college education is a very expensive proposition to students. Inflation in the cost of a college education—even in public universities, which were designed to be affordable—has created a situation where over 2/3 of American students graduate with significant student loan debts. The average American graduate of a four year university is left with over $27,000 in student loans and Americans currently have approximately $1.1 trillion dollars in student loan debts in total. Not only are the student loan debts that our recent graduates saddled with out of control, but the job prospects for recent graduates are particularly bad. Students graduate with a great education, but little opportunity to get a well-paying job (unpaid internships common) and no ability to pay back their loans. 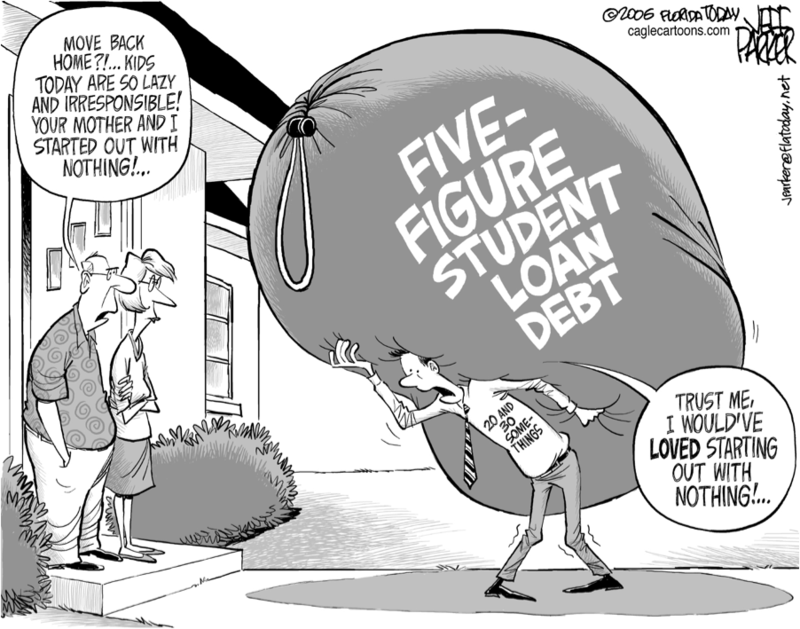 As student loans persist through bankruptcy, the propagation of this situation leads to students being unable to escape the crippling cycle of debt for decades after their graduation. Unfortunately, the Congress has not only failed to address the issue of student loan debt with pro-active solutions, but it has failed to act in preventing things from getting worse. 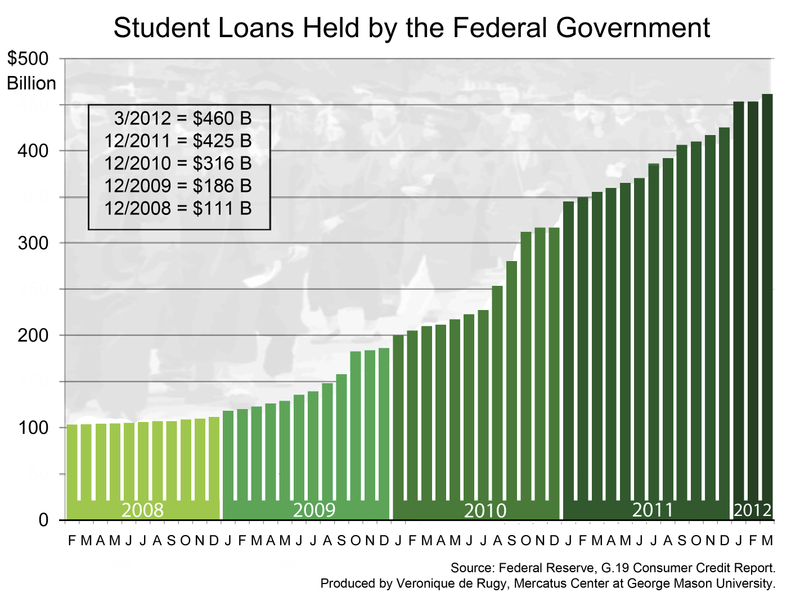 In July of 2013, the federal legislature let the interest rate for federally backed student loans double from 3.4% to 6.8%. This doubling of the loan interest rate will further exacerbate the negative consequences of the student loan crisis and will lead to immense hardship for students. A jump in the interest rate for student loans has the potential to cost American students billions of dollars a year for as long as the situation remains unaddressed—this is not acceptable. Even if one doesn’t care about these students (and there are such people), this hardship will have a ripple effect on our economy which has consequences in every field of commerce. University graduates consist of a very large portion of the population (approximately 33% of 25-29 year olds have a BA), thus the dramatic reduction in the buying power of students that comes from an increase in the interest rate will have a significant effect on the national buying power. Areas of commerce—particularly in automotive and housing markets—suffer from decreased demand when students stop buying and jobs are lost. This decrease in demand is particularly damaging today, as our economy is still fragile from the 2008 economic crash. Now is not the time to worsen the student loan crisis by doubling the interest rate and the Congress needs to immediately work to remedy this situation before it goes out of control—not only will the increased rates cause economic hardship for students, but they threaten to damage the economy as a whole. If nothing else, this solution should consist of passing a stop-gap measure to prevent student loan interest rates from doubling. That said, an ideal situation would see the Congress not only mitigate the consequences of their own inaction, but also to go a step further and pass something that substantially improves the ability of students to afford loans. As usual, Senator Warren has a very good point and I think that her proposed legislation is a no-brainer. 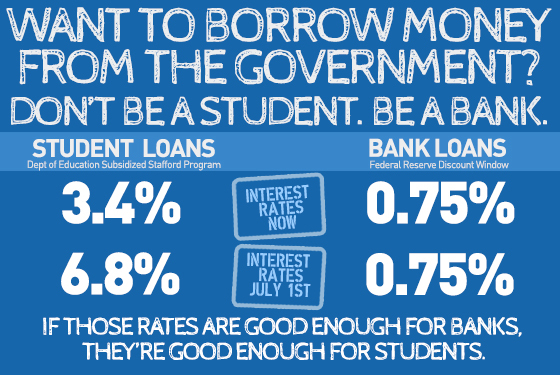 Banks are given a preferential interest rate because they promise to spur investment through loaning money to small businesses (although it certainly doesn’t hurt that they donate massive amounts to federal legislators) but students should be afforded that same rate, if not better. Looking purely at the benefits to the economy and the American people, giving students preferential rates far outstrips the gains from giving banks their preferential rates—as such, if anybody it to be given such rates, it should be the students, not the banks.